Does humanity have much time left due to the Fall's effect on our bodies? And, if not long, what can stop the decline? 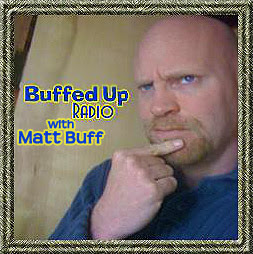 On Monday, April 23rd I was interviewed by host Matt Buff of the Rapture Ready Radio show "Buffed Up Radio," broadcast over BlogTalkRadio. During the 45 minute live show we talked about how April was a tough month for Christians. April held the Day of Silence for Homosexual Students, Pot Head Day, and Earth Day bringing out the green police. Plus, as Matt said, "Apparently, I'm supposed to be more outraged by what Mitt Romney does with his money than by what Barack Obama does with mine." We also discussed the Christianity Under Attack Conference and DVDs, the rise in Autism, as well as attempted to pinpoint when the birth of the Christian Church began for the Gentiles. Read and listen in! Matt Buff: Nathan, welcome to the program! Glad to have you back on. Nathan Jones: Hey, glad to be on, Matt! Good to talk with you again. Matt Buff: I hope everything in Texas has been going good for you. Nathan Jones: We had a rash of killer tornados come through that picked up tracker trailers and blew them all over the place like they were toy cars. They did a lot of damage down south in Forney and in Arlington where the DFW airport is. But, the Lord spared a lot of people and we've just been really blessed. This time of year could be far worse in the way of weather, but recently here in Dallas we've been blessed. Matt Buff: That's good that you were able to avoid some of those tornadoes. We've had some listeners write in that weren't as fortunate as they've been very close to the action. This is a prophetic year in my eyes because when we have as many natural disasters and are setting temperature record after record after record, we can look around this world and know to be looking for the imminent and soon return of Jesus Christ. Nathan Jones: Amen! Weathermen report that in this heat wave we've had 15,000 different records broken this year. On the flip side, New England is getting a freak snowstorm which they usually don't get even by the end of April. The weather this year is already going crazy and I can't even imagine what the summer is going to be like with the heat being so high as it already is. Then there's the earthquakes we've been experiencing. The Lord is telling us something with this. He's trying to shake us out of our apathy by saying, "Look up, for I'm coming soon!" Matt Buff: Amen to that! Matt Buff: You and I were talking a little bit earlier on Facebook about how it's been kind of a tough month for Christians just here in the United States. On April 20th we had the Day of Silence for the homosexual community. Also it was called Weed Day. April 20th is now a day for all the pot heads all over the United States to celebrate (although they don't move very quickly when they're celebrating it!). Also in April we've had Earth Day. When I was a kid Earth Day was a cool thing. You would go out and plant a tree and appreciate your earth. But now, "green police" are out in full force trying to tell you what to do with your life and how to change and make things better so we can "save the planet." They are trying to save a planet that they are not even in control of. Nathan Jones: Yes, and then they blame all the problems of the world on Global Warming. Matt Buff: Speaking of that, another prominent scientist came out today with an article which strangely enough was posted on MSNBC. He even recanted his book he wrote in 2006 saying something like, "I was an alarmist and I shouldn't have been because clearly the situation isn't what I thought it was." Nathan Jones: The whole notion behind Global Warming is that it's a propaganda war really. One day you read about 49 scientists who come out and say, "Hey, this Global Warming thing just doesn't have any scientific evidence." And then, the next day the opposition comes out with an article saying that more Christians in churches are adopting issues about Global Warming and how to deal with them. So, this agenda is definitely a war for the hearts of the people. This propaganda war is close to me because my youngest son is eight and he's autistic. Every week there's a new article that comes out with somebody declaring, "This is the reason for Autism." Every week the reason behind Autism is something different, but in reality it's always agenda based. For example, just the other week the reason for Autism was because the mothers are overweight. They are obese and therefore that condition is causing Autism, so we need to do something about that and get these women to lose weight. Such a claim flies just out of the blue, and there's no scientific backing to the claim, but they can use Autism to help fight the obesity issue. Or, if its an environmentalist cause like ridding the world of pesticides, well these environmentalists will claim that pesticides are getting into our children and so therefore we need to get rid of all pesticides. It's just shameless how Global Warming and all these different issues are used as propaganda tools to push people's agendas, and pushing one's own agenda is what everything's about lately. There's no agreement to be found out there. There's a total disregard for uniformity of facts as everybody is out there with their own agenda doing their own thing. The mass self-interest is just tearing the world apart. Matt Buff: It is tearing us apart. We are being forced to pick sides. Someone somewhere probably does blame Autism on Global Warming as there's nothing else to blame it on. Speaking of Autism, I had my four year old tested for Autism. I don't know exactly what you are going through, of course, but I know a little bit about it by the studies. Supposedly, now we have 1 in 110 children labeled autistic in this country. Nathan Jones: I've seen the latest results and it's now 1 in 88 children! That's the statistic that just came out in March of 2012. They demonstrate a continuing trend every year of more and more children becoming autistic. For boys it's a whopping 1 in 44! These increasing numbers definitely has become a major issue making people finally start to take notice. With the rise in Autism I often hear the whole idea of the survival of the fittest being lauded. I'll hear that from some parent when it comes to getting vaccines for instance. They don't care if some kids get Autism as long as their kids are protected from almost non-existent diseases like polio. So, you're four year old tested for Autism? Matt Buff: Yes, and it came back negative. He has a myriad of issues, but Autism was not one of them. I am thankful for that. There are lot of things we have to do with him, though. He has lots of syndromes and symptoms of things, but Autism isn't one of them. What saddens my heart is we have so much money going to the lazy in this country, yet Autism is the least funded and yet most effecting issue the people in this country increasingly need to face. I know funding is starting to pick up for research, but at this time you are right, doctors don't know where Autism comes from. I've heard the reports that it could be caused by vaccines, or maybe too many vaccines at once. So, understandably, parents are backing off the vaccines now because they are just not sure if they're the cause. You and I with children have our hands up in the air because we just want to do what's best for our kids, but with so much conflicting information and opinions this country sure is making it tough. Nathan Jones: The closer we get to the end we will see the breaking down of the human genome. We live in a time with all the medicines that we've got that are supposed to help us prolong our lives, but it seems like we are just getting sicker and sicker and our kids are getting poorer and poorer health-wise. Do you remember that old Michael Keaton movie Multiplicity where he made carbon copies of himself. Well, one of the carbon copies decides that he is going to make his own carbon copy of himself, and this new carbon copy of the carbon copy ended up being really stupid and it couldn't do very much. Like that, I'm wondering if the human genome is breaking down as we go through time and are constantly living under the Fall. We are constantly bombarded by radiation and subjected to our own nuclear experiments and food additives. Who knows how fast the human genome is wearing down, and if the Lord didn't come soon how far before we have a whole society that is genetically totally broken down? I don't know for sure how much longer we've got as a species, but I'm sure the human population doesn't have very much longer before we need Jesus to come back and lift the Curse partially off the world during the Millennial Kingdom and restore the human race to the lifespans and health we had before the Flood. I think then we will stop seeing so much deterioration in the human body like we are seeing today. Jesus' return will result in an end to there being autistic children and people who are just sick due to genetic disabilities. In the next part of this interview with Matt Buff concerning Romans 1 and society, we'll look at some of the false examples of what humanity turns to when we shed our morality. Really interesting interview, Nathan. I've long thought that we were "breaking down genetically". I believe it is in part due to the fact that we keep people alive who never would have survived in the past. It used to be common that families would lose at least one to two children to disease and sickness before they were grown. WIth the advent of antibiotics in the forties, you rarely hear of anyone losing a child to an infectious disease (at least here in the states). I had pneumonia as an 18 month old infant. Antibiotics helped keep me alive. I have since developed hypothyroidism. Thyroid hormone keeps me alive. Would I have survived childhood without antibiotics? I don't know. There are many, many people like myself. There are also many who have been over treated with antibiotics and have come down with gut diseases. As humans, we think we know so much, but really we have no idea of the full extent of what medicines and especially antibiotics are doing to us. Come Lord Jesus because we can't solve all the world's problems, including health problems. and I'm not sure about others who seem to choose a certain life style only the ones who feel uncomfortable in who they are??? just an observation but it does go along with all our problems with disease and mental health etc. There is no evidence to link vaccines to autism. The guy who wrote the article/study admitted he fabricated results and Lancet retracted the entire study. Most vsccinces have taken the Thimerasol out of them now. I know those parent with autistic children would like to have answers but I don't think vaccines are it. Billy, I deleted your comments because history shows you'll regret them tomorrow. Get some control of that temper, brother. July 4th, a ten year old boy is enjoying the day with his family. A phone call. The boy’s aunt has been rushed to the hospital. His aunt who got polio as a child which left he physically crippled and mentally challenged. Everyone goes over to grandmas. In the early morning hours of the next day, the boy’s father comes in where the boy and his brothers are sleeping. The boy is awake but pretending to be asleep. He hears his father tell his older brother that his beloved aunt, whom he much loved and was much loved by her, has passed away. The father leaves and the boy can pretend no longer to be asleep as the tears flow and his older brother consoles him. By singling out polio in this article, WHY is beyond me, Nathan Jones ripped open my old wound and rubbed salt into it. Additionally, he can’t just argue against vaccinations which is his right to do. No, he has to also say anyone who disagrees with him wants children to die! So, I gave it right back to Mr. Jones as my blood boiled and my heart pounded. For he had the audacity to make light of polio, the disease that KILLED my aunt, AND, in effect, say that I WANT CHILDREN TO DIE. So I just gave his own argument RIGHT BACK AT HIM! Using his own disgusting argument was a very bad thing to do. I stooped to his level and muddied my hands also. And for that I apologize. Saying Nathan is disgusting was not an accurate choice of words either. Nathan’s ARGUMENTS disgust me. Nathan does NOT disgust me. And for that I apologize. I do NOT apologize for saying that Nathan’s argument is disgusting (that is, if you disagree with me you want children to die). Thank you Nathan for deleting my comments. They were done in anger. But, if you read my story from my childhood, perhaps you can understand WHY I was so very angry at your comment. Billy, you've read waaaaaaayyyyyy too much into Matt and my conversation. Nobody's attacking 10 year old Billy or his beloved aunt or people with polio. Nobody's attacking your perceived weight. This ministry isn't out to get you, Man. We've been friends for years now and you should know that. It figgers! I couldn't get back in time so Nathan beat me to it. But then, he's got time on his hands, spinning circles in his command chair... weeeeee! Are you reading the same article that I'm reading?!? Yer not using one of those Apple computers are you, 'cause I am not seeing anything at all in Nathan's article like what you're going off about?!? I'm almost at a loss for words... ...other than to say you've got a lot of nasty rocks in your sandbox that need to get tossed out... and NOT at people! As far as his innocuous comment; "...almost non-existent diseases like polio...", if you have read stuff like "The Signature of God" by Grant Jeffrey, you would know that America had been blessed by following the hygiene and sanitation methods that God gave in the Mosaic Law and had almost completely eradicated the majority of these deadly diseases. This is one hot-point area for Michael Savage, who holds a doctorate in epidemiology, in his rants on "Borders, Language, & Culture", that many of these diseases are now on the rise again due to the uncontrolled flood of infected, un-inspected, illegal aliens. On the other hand, there is the artificial, unnatural, rapid rise of diseases that are not related to hygiene and sanitation; Autism, diabetes, heart disease, obesity, & the like. Those who have honestly looked into the real causes will come to the same conclusion, as noted in my link above; that we are under a deadly assault by Satan's minions on all fronts. Good riddance all of you. I'm outta here. My best to the rest...Sue, Susie, Rodney, et al. You are my Christian friends and I wish you the best. The same to L&L, Nathan, etc. Sometimes it is best just to move on. It's just too bad it is with the snide replies I rec'd. Let the record show, however, as I leave, that some people only care about things that affect them personally and diminish others with just as tragic situations as that doesn't fit into their "poor me, put the spotlight on me and me alone" agenda. "Nobody's attacking 10 year old Billy or his beloved aunt or people with polio." Turn my sharing of a personal background story into a joke. My comments weren't for YOU! Next time mind your own business. Billy, I apologize if I came off harsh to you, but I have to 2nd both of Nathan's comments to you; "you'll regret them tomorrow", and nobody here is "out to get you, Man. We've been friends for years now and you should know that." Quite frankly, if anyone should be offended it should be Nathan for that wholly unwarranted assault on him, but he knows you and he has a very gracious spirit, even though you're doing it again with yet another unfounded accusation of turning "a personal background story into a joke..": Nobody's attacking you or what you went thru as a 10 year old! My dad died over 8yrs ago, yet I don't feel any compelling need to lash out at people who might happen to mention brain lesions or dementia in passing. There is NO direct correlation between the two in either your case or mine, unless you choose to read something into it! In that you posted your tirade on a public forum makes it everybody's business and quite frankly I think you owe all of us an apology. Nobody wants you to go away! You've been a good contributor here for quite a number of years. We just pray that after you have a chance to cool off and reflect on it for awhile, you might be able to put things in proper perspective. This is none of my business either, but I just wanted to offer a hand of encouragement to Billy. imo this incident is the straw that has broken the camels back. There have been a few more things in the recent past that has been of concern to Billy, and he has faithfully spoken out and said what needed to be said while remaining loyal. This was a step too far and my heart goes out to Billy. Billy, i just want to say ... i love u in the Lord brother. Please dont leave the blog, or at least maybe give it a little time to reconsider and consult the Lord.... i am not always in support of things said here either ,, but dont we all have a special fellowship? If rodney can hang with it... :)..... hopefully u can too... just teasin ya rodney. I came back to respond to any follow up posts. I had private discussions with Nathan via email and while the content will remain private there are no issues between he and I.
Susie and Anon, all I can say is wow...I am touched by your very forgiving Christian replies to a fellow Christian who was obviously having some issues. To know of your kindness was a blessing. Nathan responded in similar fashion. For this I am so grateful. You have set very powerful Christian examples that I hope to be able to draw upon in the future and hope to be able to follow as examples. I only wish I could say the same for you as I did for Anon, Susie and Nathan. I asked you to stay out of it but you just couldn't resist. Well, I forgive you for punching me in the gut while I was down. I do not apologize as this was between me and Nathan and I asked you to keep it that way. I am leaving this site for now while I deal with the issues I identified that need dealing with in my private emails with Nathan. It will be a while before I come back, if ever, but if and when I do I hope it to be as a humbled man that has not only leanred something but that it actually did prompt a needed change.